One hundred hard hat tours later and we're still not tired of urban development. Lofts. Condos. Retail centers. Office buildings. Mixed-use masterplans. Having offices in one of the fastest growing cities in the United States has always been a boon for working for the best. Our communication experience for the area's most significant urban developments, ranging Boca Park and East Village, has spilled over into work with architects, contractors, and developers nationwide. 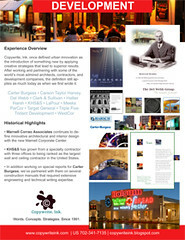 You can catch a few samplings of our urban development work at Copywrite, Ink. For account experience in other industries, download our select account experience lists. Our next pdf portfolio page, which will focus on residential development, will be released on or before Sept. 25.